Some of our state of the art flooring insatlled last week by Fitness Equipment NI. 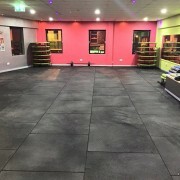 Two days ago we installed state of the art rubber flooring in Believe Fit on the Newtownards rd in Belfast. I think you will agree it looks amazing! They are open for business from today and have some of the best PTs in the country. So get down there or give them a call. FREE CLASSES ALL DAY TODAY !! !